Jenison students have the opportunity to begin participating in Band in 6th grade. Typically, about 150 students start their first year in band with before-school classes held at the High School in like-instrument sections twice a week, and in a full band setting once a week. Students also have one mixed instrumentation class at their elementary school each week. The 6th Grade band performs three concerts each year. Students are strongly encouraged to begin taking private lessons through the Jenison Summer Lessons program to continue to advance their playing skills before 7th grade. In Junior High, students continue to participate in grade level bands. For both the 7th Grade Band and 8th Grade Band, sectionals continue to be an important part of weekly instruction. Anne Gembis and Marc Palma lead the 6th through 8th grade program, but all four directors are actively involved with teaching the students at every level of the program. This team teaching approach is a vital part of the sequence, continuity, and success of the program. Both Junior High bands participate in several concerts as well as MSBOA Band Festival. Additionally, the 8th Grade Band performs with the High School Marching Band for pre-game and halftime at Homecoming in the fall, and marches on their own in Jenison’s Memorial Day parade. In the spring, 8th through 11th graders are placed by audition into one of three High School ensembles: Concert Band, Symphonic Band, or Wind Symphony. Members of the concert bands perform in 3-5 formal concerts each year, as well as elementary tour concerts, Commencement ceremonies, and of course MSBOA Band Festival. All five Junior High and High School concert bands consistently receive First Division (I) ratings at MSBOA District Ten Band Festival. The Jenison High School Marching Band is the most visible aspect of our program. Students, directors, staff members, and Band Boosters all work hard every year to maintain, and build upon, Jenison’s reputation of excellence both on and off the competitive field. The band was the MCBA Flight II State Champion in 2018, 2017, 2013, 2012, 2011, 2004, 2002, and 2001. They have earned recognition as a Bands of America Grand Nationals semifinalist and Regional Championships finalist many times. The Marching Band enjoys tremendous support from the JPS Administration and the Jenison community. High School band students have many other opportunities for extracurricular ensemble performance. The Jazz Band meets once a week after school and performs at concerts and the Thornapple Arts Council Jazz Festival. The Pep Band is an all-volunteer group which plays for several home basketball games, and typically includes well over 50 students at each performance. Select Wind Symphony members participate in the full Symphony Orchestra. The Percussion Ensemble rehearses after school and hosts its own concert in May each year. Other performance experiences such as Solo & Ensemble Festival and musical theater pit orchestra are encouraged throughout the year. The color guard program is another very active and successful facet of the Jenison Bands. In addition to the fall Color Guard’s fantastic visual contribution to the Marching Band, Jenison offers two competitive Winter Guards, open to students in grades 7 through 12. The Varsity Winter Guard has been named MCGC Scholastic A State Champions 6 times , and the JV Winter Guard won their class (AA) in their first year of existence (2012) as well. Jenison Public Schools has a long tradition of excellence within the music department. All four programs (Band, Choir, Orchestra and Elementary) have been recognized as outstanding in their respective fields. This excellence is due in large part to the consistent and outstanding support for music shown by the Jenison administrative team, as well as parents and community members. Jenison’s music staff members intentionally collaborate closely on many events each year, and consider it a privilege to be a part of such an amazing and effective team. Each year, there are over 1250 students who elect to enroll in Jenison’s Band, Choir, and Orchestra programs. On average, over one-third of all High School students and over two-thirds of all Junior High students choose to participate in music. One of the greatest strengths of the music program is that students have the opportunity to select two music classes each year if they desire. This choice may involve taking zero hour classes some years, but many students choose to participate in two music programs all the way until graduation. Jenison students receive outstanding elementary general music instruction from their Kindergarten through 6th grade years. When students reach 5th and 6th grade, they may participate in an after-school elementary choir, and some students are selected to perform in an additional elementary honors choir. The four elementary music teachers skillfully ensure that all elementary students receive a strong foundation in rhythm, pitch, note reading, and music appreciation. Orchestra instruction begins in the 5th grade, where students meet twice per week before their school day, and once per week as a pull out during their day. In 6th grade, the Orchestra classes also meet twice per week before school, and once per week during the day. Beginning in Junior High, all Orchestra classes meet daily for an hour. There are three Orchestra classes offered at the Junior High, and three at the High School. Band instruction begins in 6th grade with three weekly before-school classes and one weekly class during the day. Students participate daily in two Junior High bands, and three High School concert bands. In the fall, most of the High School band students also participate in the nationally recognized Jenison High School Marching Band. Secondary choir instruction begins daily in the 7th grade, with four Junior High girls choirs, and one 7th through 9th grade Male Chorus. At the High School level, students are placed in one of five choirs. The Jenison Chamber Singers are frequently selected to perform at the Michigan Youth Arts Festival, and several Junior and Senior High choirs have performed at the Michigan Music Conference. Founded in 1845, Jenison is a Class A public school district, located about ten miles west of Grand Rapids. The Jenison Public School District has outstanding and innovative educational programs that serve the needs of more than 5200 students. The district’s reputation for educational excellence results from the tradition of an outstanding teaching staff, eager student learners, appreciative community supporters, and expansive curricular and co-curricular opportunities. The district maintains a highly regarded Early Childhood Center which offers several daycare, preschool and K+ programs. There are five elementary schools which include students through 6th grade. The Junior High nurtures around 750 7th and 8th graders, and the High School educates over 1500 students. 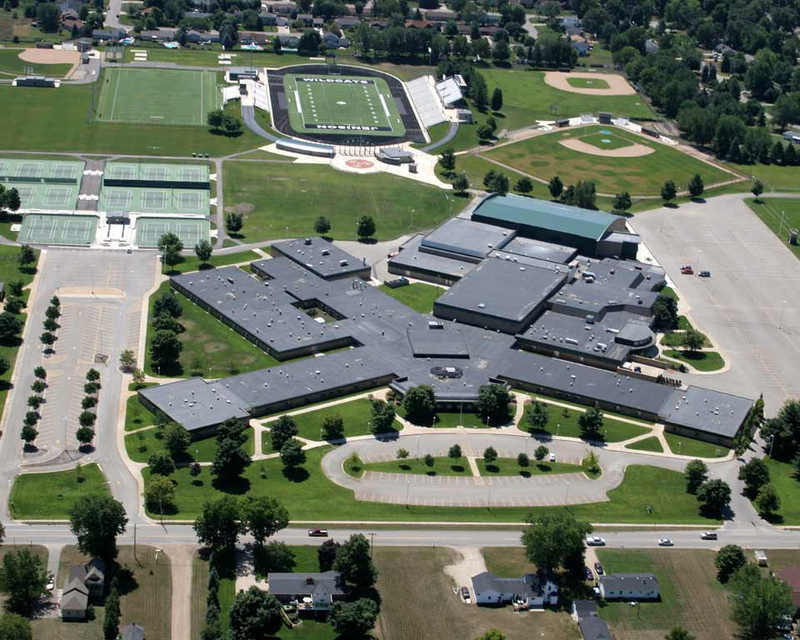 Throughout the last decade, Jenison High School has earned Newsweek’s “Best High Schools in America” recognition seven times. Jenison High School has been designated a “GRAMMY Foundation Signature School” three times, and the Jenison community has consistently been named one of the “Best Communities for Music Education” by NAMM for over ten years. Dave Zamborsky is the Director of Bands at Jenison High School. Prior to his arrival in Jenison in 2002, he taught for eight years as the Director of Bands at Parkway West High School (his alma mater) near St. Louis, Missouri. Dave earned his Bachelor of Music degree from Northwestern University and his Master of Music Education degree at the University of Missouri - St. Louis. Dave’s teaching responsibilities at Jenison include Wind Symphony, Concert Band, and Marching Band, as well as shared responsibilities team-teaching 6th, 7th and 8th grade band students. Dave is the Secretary of the Michigan Competing Band Association, and is the MSBOA District X Vice President for Band & Orchestra Festival. In his free time, Dave enjoys running, reading, composing and arranging. Seth Justice is the Assistant Director of Bands at Jenison High School. Prior to teaching at Jenison, Seth was the Director of Bands at Shawnee Local Schools in Lima, Ohio from 2016-2018. Seth earned Bachelor of Music Education and Bachelor of Music in Tuba Performance degrees from The Ohio State University. At Ohio State, Seth was involved with the Marching Band, Wind Symphony, Symphonic Band, Athletic Band, and Symphonic Choir. Seth's teaching responsibilities at Jenison include the Symphonic Band, Concert Band, assisting with the Marching Band, as well as team-teaching the 6th, 7th and 8th grade bands. When not involved with music, Seth enjoys watching and playing sports, cooking, baking, and hiking/exploring. Anne Gembis began teaching band at Jenison Junior High School in 2005. Mrs. Gembis earned her Bachelors in Music Education from Western Michigan University and holds a Masters Degree in Music from Southern Oregon University. Anne’s primary responsibilities in the Jenison Bands are the 6th, 7th, and 8th grade bands. The Jenison Junior High Bands consistently receive top ratings at festivals. When Anne is not teaching, she enjoys running, traveling, cooking, and spending time with her husband, Zach, and two young daughters, Claire and Lydia. Marc Palma began teaching at Jenison in 2017, after teaching for 19 years elsewhere. Prior to Jenison, Marc taught at Lakewood, Forest Hills Central, and Sparta. Marc earned his Bachelor of Music Education degree from Central Michigan University and his Masters of Music Education degree from Western Michigan University. While at CMU, he was a DMP recording artist with the “Robert Hohner Percussion Ensemble”. Marc’s teaching responsibilities in the Jenison Bands are team teaching the 6th, 7th and 8th grade bands as well as a fall band for high school students. He is also currently the MSBOA District X Treasurer. He and his wife Earon have been married for 17 years and have two children; Mia and Evan. Besides teaching and performing music, he loves spending time with family, watching and playing sports, and being involved at his church.